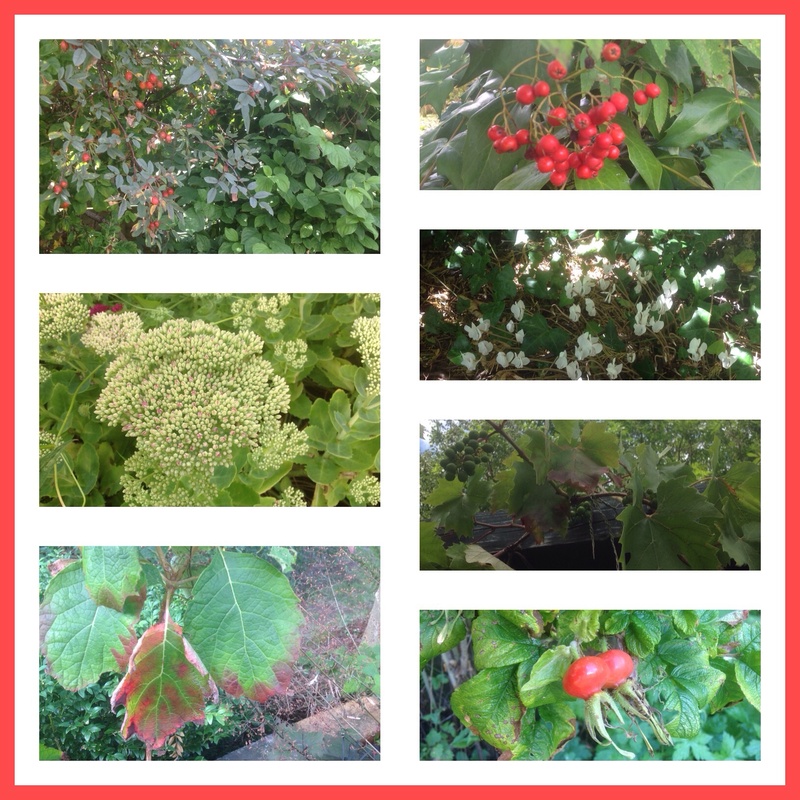 I thought it was about time I showed you round our garden, so I’ve created a new page to my blog. It’s got a plan and everything! 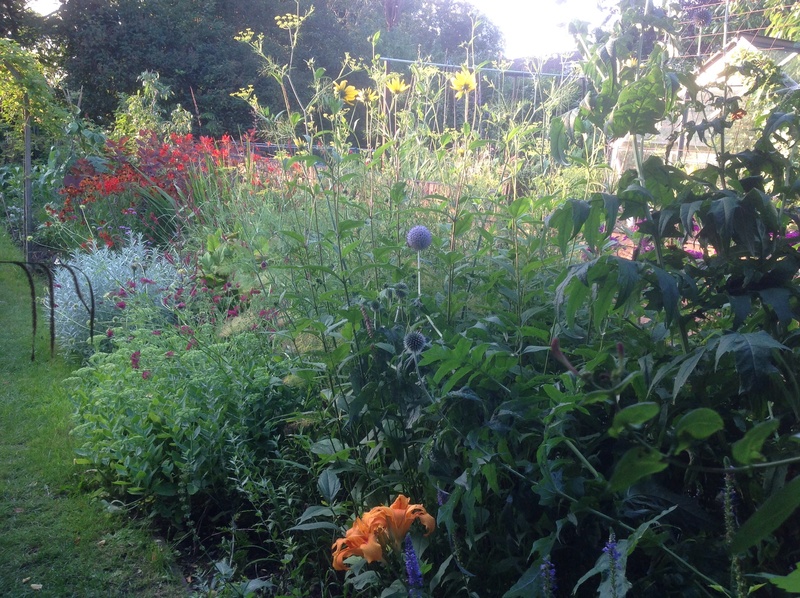 After all, I’m supposed to be able to design gardens, so I should be able to come up with a plan of my own! 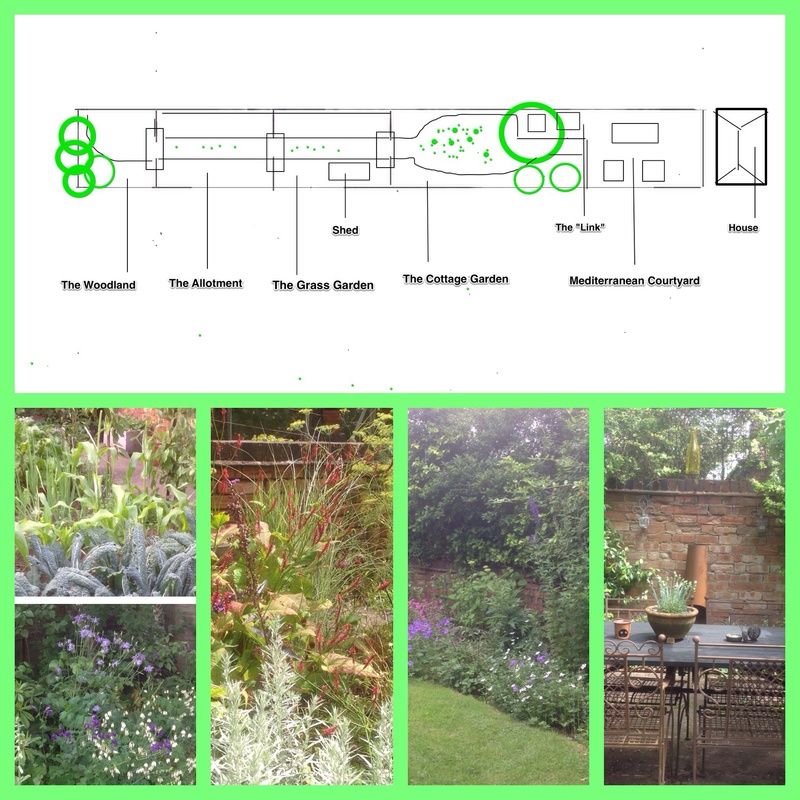 This entry was posted in Garden Design and tagged Allotment, Cottage Garden, Garden plan, Grass Garden, Mediterranean Courtyard, Woodland Garden on August 31, 2014 by thelonggardenpath. Wordless Wednesday – Barking Mad! 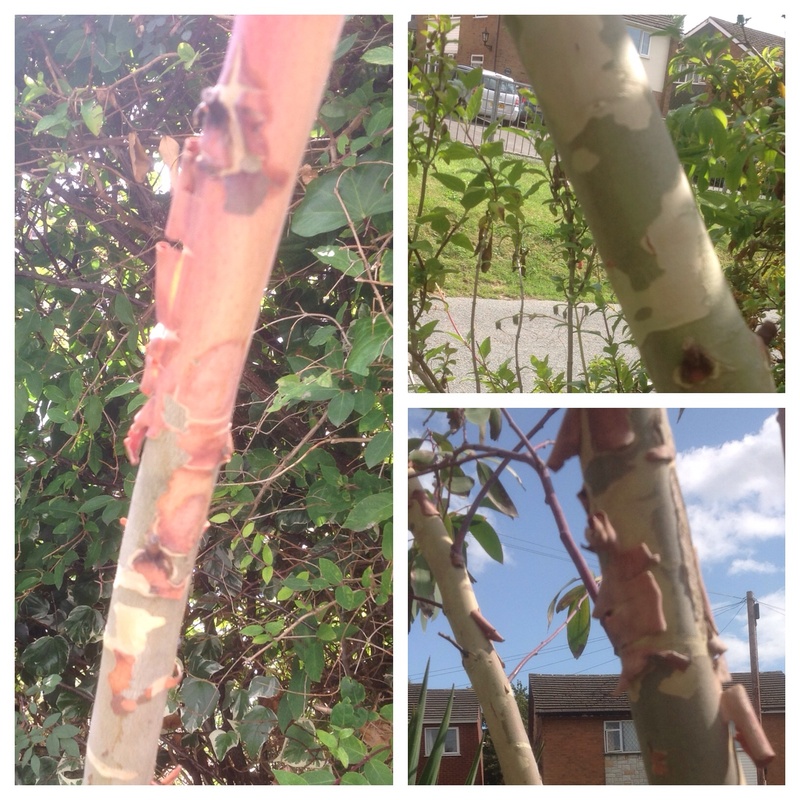 This entry was posted in Uncategorized and tagged Bark, Eucalyptus pauciiflora, Wordless Wednesday on August 27, 2014 by thelonggardenpath. 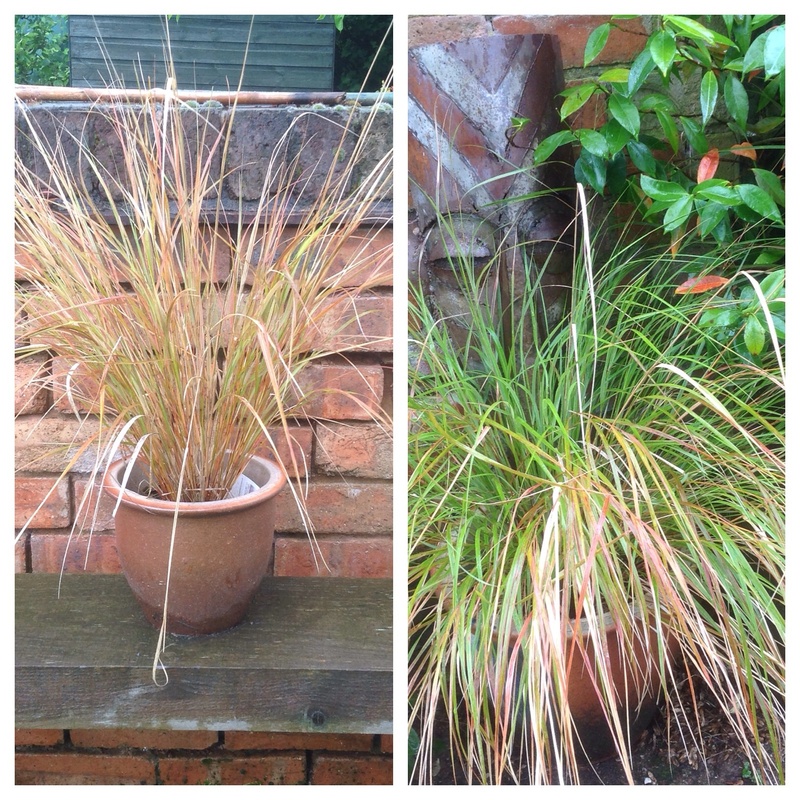 I think now, at this time of year, is a good time to show you some of my grass collection, and some of the ways I use them in the garden. 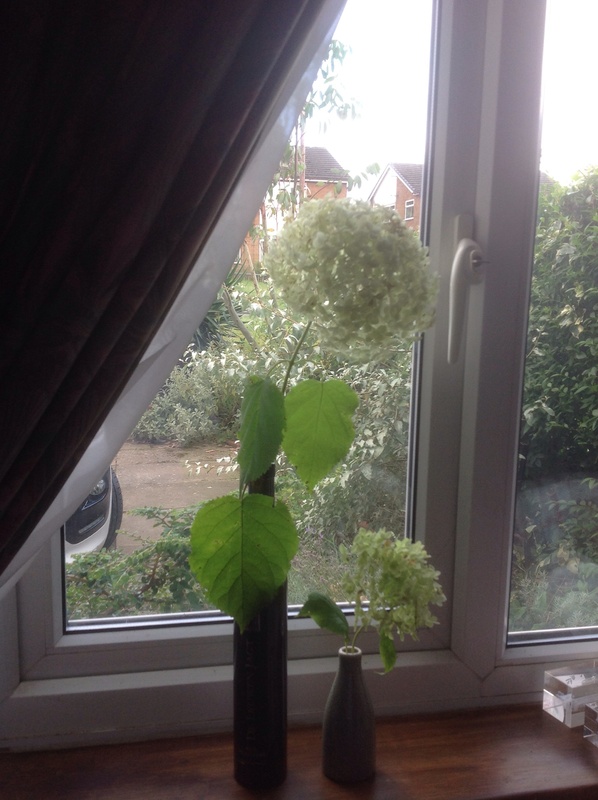 These photos are not current – they were taken earlier in the year, when I was tending to my pots, and this idea came to me then. Scent is not my only love in the garden. I love the graceful movement that grasses give to a garden, with their wonderful light and airy texture, and their tactile qualities. So I have lots, and use them in many different ways. 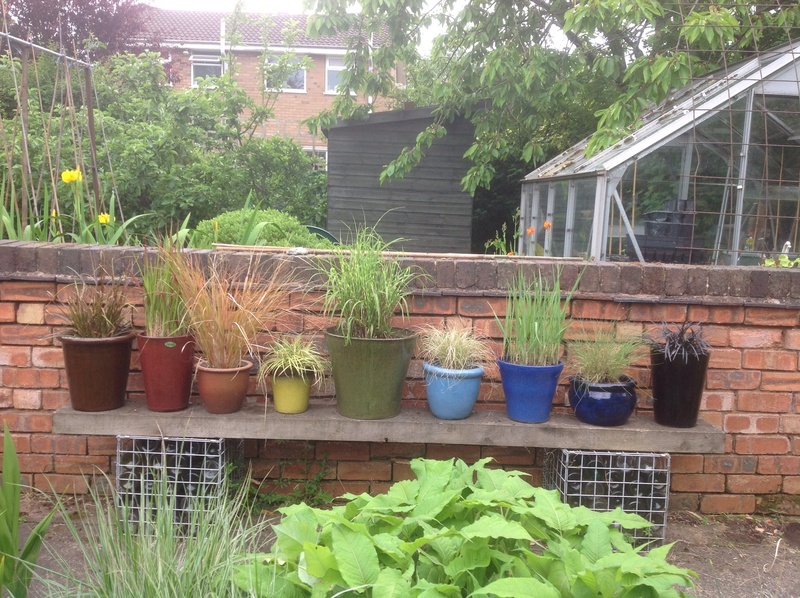 I came up with the idea for my Rainbow pots, while admiring all the colour variations, you can get with grasses. 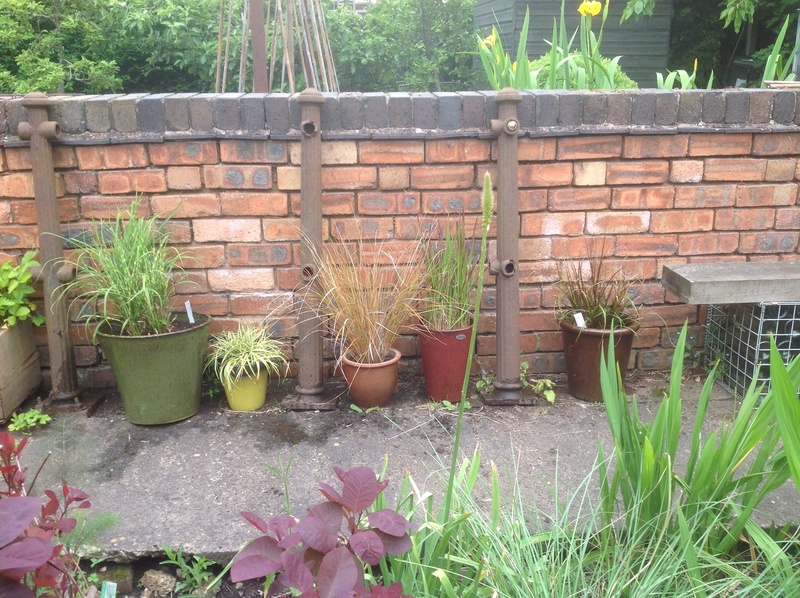 Knowing there were many brightly coloured glazed pots available on the market, I thought, “Why not have a collection of cojloured grasses with complementary pots? They should look good lining the path against the wall, in the hot coloured Grass garden.” So here they are all in a row! They don’t all actually sit in a row on our bench! They’re arranged in two groups either side. 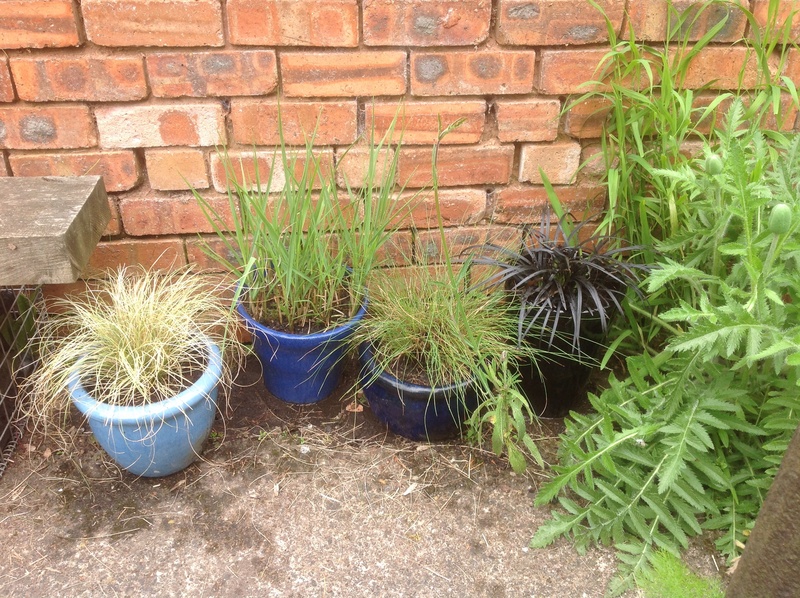 This group are the hotter coloured pots…. BLACK – Ophiopogon planiscapus “Nigrescens” – which isn’t, in actual fact a grass, although it is frequently referred to as the black grass. It is a member of the lily family, also known as Lilyturf. But it has the same effect. 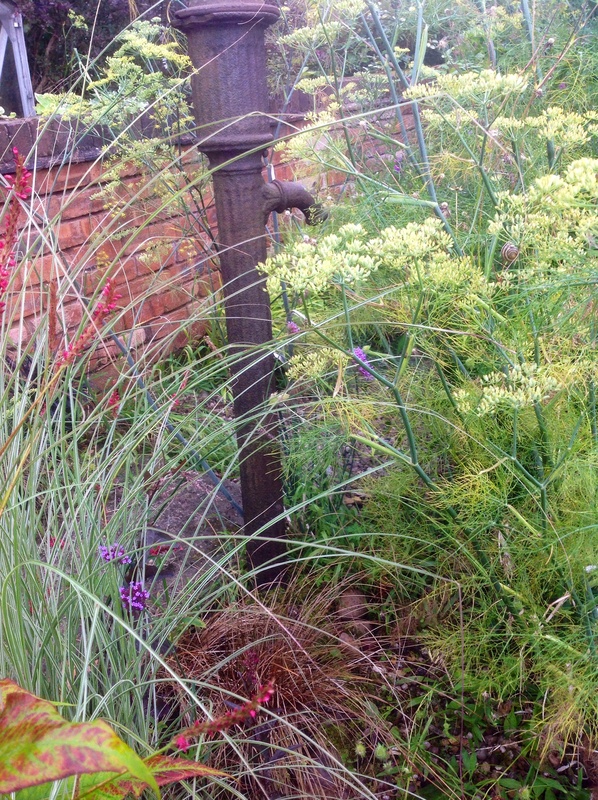 And so a collection of colourful grasses! 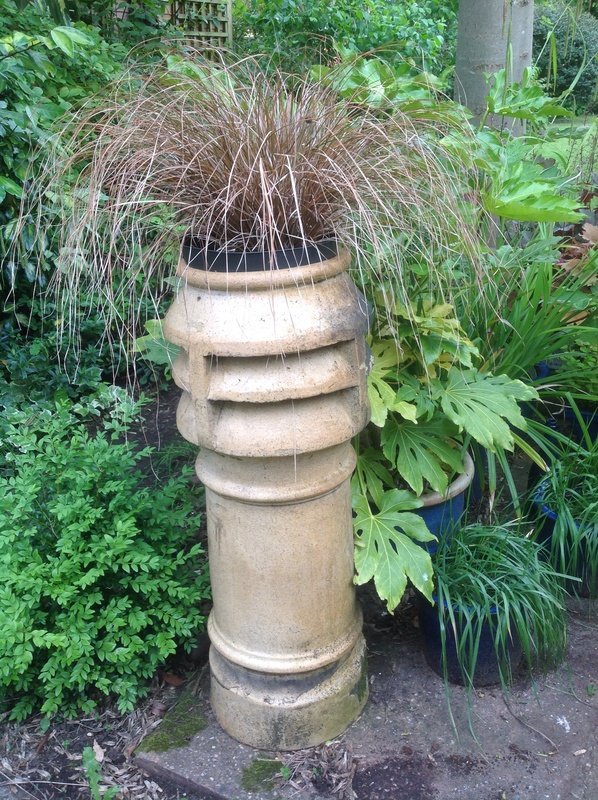 Having shown you Anemanthele in one of my pots, see what a difference some shade makes! 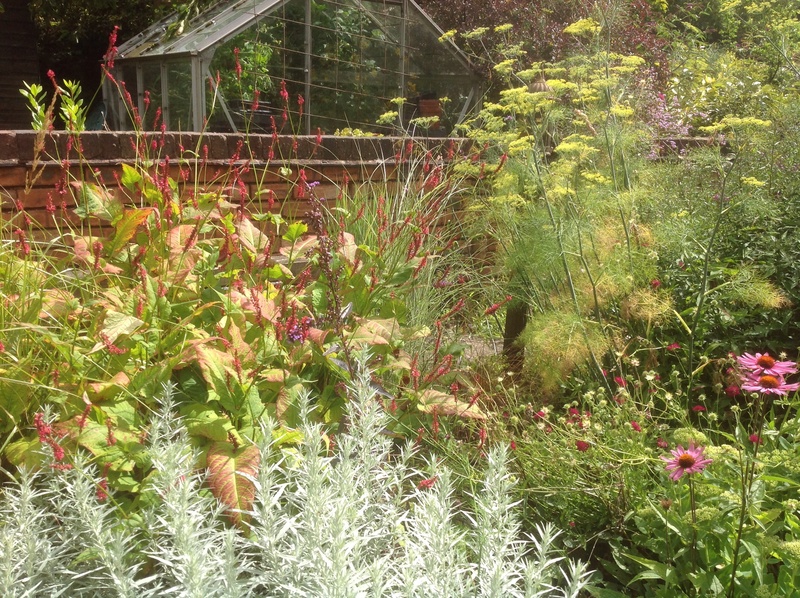 The Anemanthele on the left is so much more lush and green, growing in a pot in another, shadier part of the garden. Another experiment I tried, which I think has worked extremely well for me, is using Hakonechloa macra to line a gravel path. 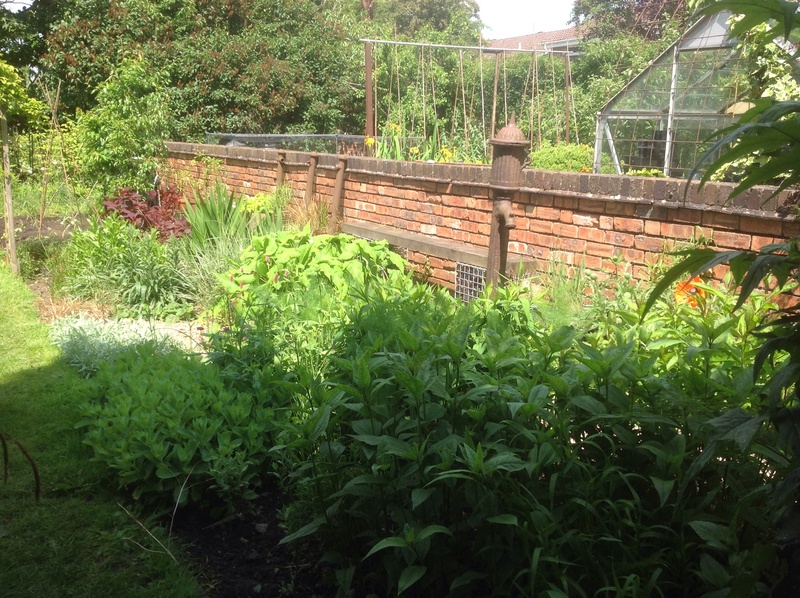 Here, it lines the gravel path adjacent to the garden wall, interspersed with boulders. 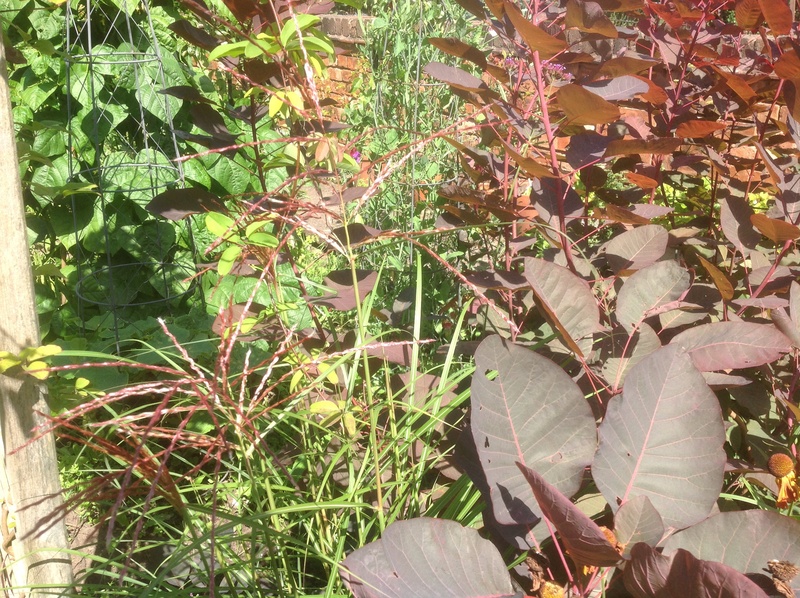 Although it is a shade lover, it’s doing really well in this sunny position. I love the effect it creates here, en masse! 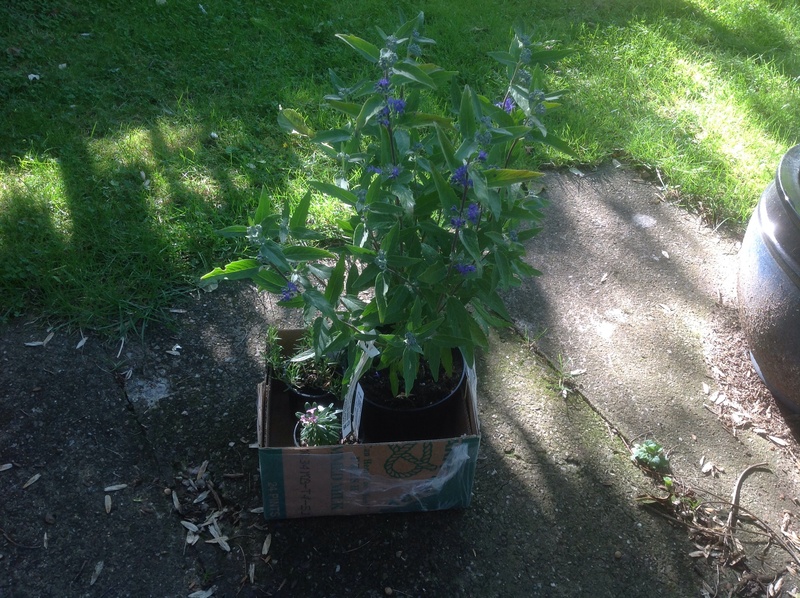 – what better way to plant up an old, chimney pot?…. 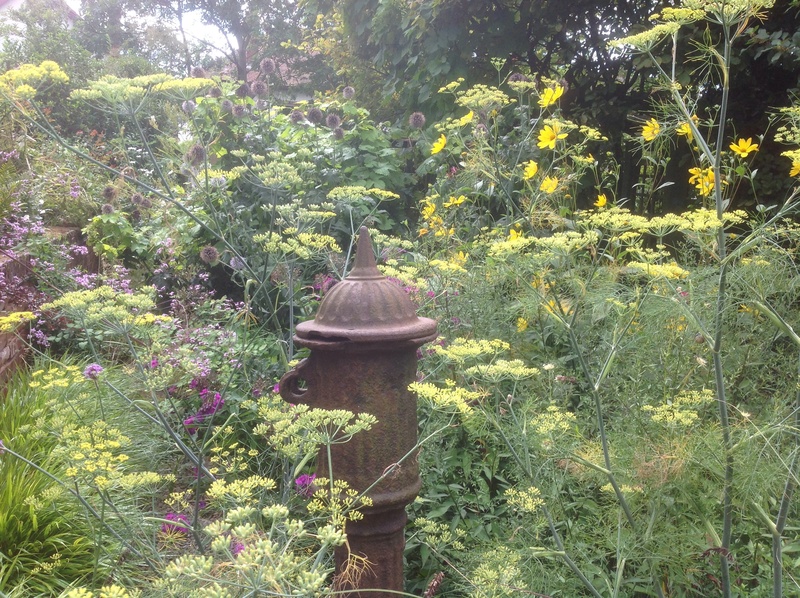 ….or to skirt the base of an old, rusty water pump?…. 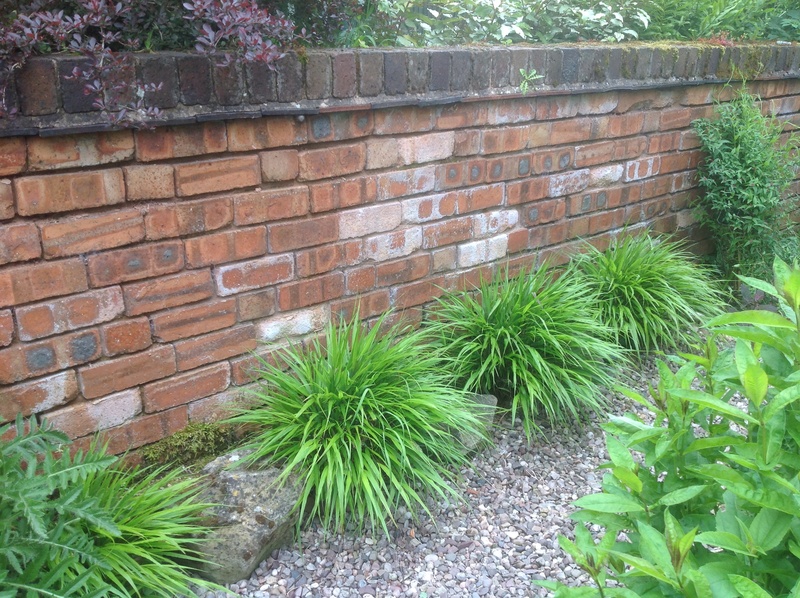 ….than our old faithful, Carex buchananii! 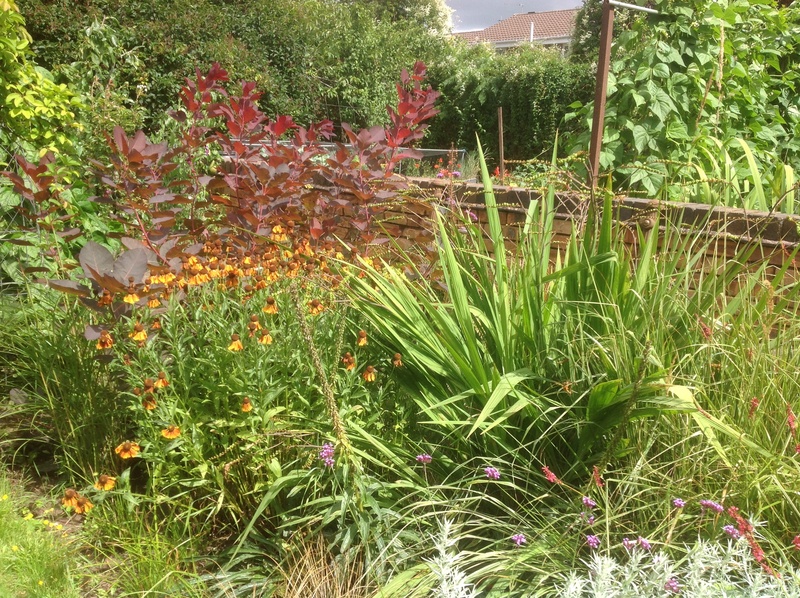 This entry was posted in Uncategorized and tagged Anemanthele, Carex, Festuca, grasses, Hakonechloa, Imperata, Miscanthus, Ophiopogon, Panicum, Pots, Uncinia on August 24, 2014 by thelonggardenpath.